I was given an invitation to attend a press conference being held by The Ontario Lung Association featuring Canadian race car driver Ron Fellows for the new promotion called “Campaign for a Smoke-free Ride” but I couldn’t go – that darn day job gets in the way! Fortunately through a series of emails I was able to get a phone interview with Ron himself. It was a good interview but it had some technical difficulties because of cell phones hitting dead spots but Ron held in there and gave me a full interview – I think I’m on his speed dial now because of all of the call backs. Campaign for a Smoke-free Rideis designed to give parents who smoke the information and support they need to give their kids a healthy, smoke-free ride. If you’re a parent who smokes, you know it can be hard to resist lighting up in the car. But it exposes your kids to the risk of serious childhood illnesses. Even on short trips. Even with the windows rolled down. And believe me, being the child of parents who smoked while I was in the car was awful. Simply awful. And I support this Campaign and Ontario Law 100%. Now take the jump for the interview! See you on the other side. With the economy the way it is and GM’s outlook not looking so good what are your plans for the upcoming race season? Certainly there’s less money there and we’re still waiting to hear. The Corvette program is a huge image builder for not only Chevrolet but for GM. We’ve been extremely successful with the Corvette program and its going to be a reduced schedule for sure and we’re making transition to a GT2 and we’re all hopeful that the program will continue even if it is on a limited basis. You are a big supporter of grass roots racing, how important is that to you? What do you think the future of seeing a NASCAR Cup race in Canada is? I don’t know, but NASCAR is a business and the primary business partner for NASCAR is Sprint and I’m guessing that until Sprint has the potential to do business in Canada I don’t think you’ll see a Cup race here. The Nationwide series is a little different. There are opportunities there (for them to do business in Canada) and I think it is enough for them to test the waters up here. It’s been hugely successful the two years that they’ve run at Circ de Villeneuve so we shall see but never say never as far as cup races I think regardless if it’s going to be an oval like the proposed one in Fort Erie or a Cup car race in Montreal – that’d be cool too! Would you like to see more road races in Cup? Laughs … as a road racer I’d like to see half the cup schedule as road races! There was talk a few years ago that they were going to get as many as four just based on the demand for cars – building road course specific cars and it made more sense to have more road races just so they can race the cars they built. But that has quieted down a bit. You know if you look at North America, in particular the US, the tracks being built these days are road course where a lot of them are motorsports ranches where guys are members of these country clubs and it seems to be the trend. You should see the country club Spring Mountain near Las Vegas where my racing school is it is spectacular. I think for Corvette racing it generated a lot of interest and for years after that the NASCAR community followed the Corvettes and the Infinion race at Sonoma is the week after LeMans and I’ve been going there after LeMans since 2001 and the number of NASCAR people that were paying attention, especially after we won our first one was great. One of the first guys I run into in the garage area after that win was Richard Childress and he said congratulations on that class win at Lemans that was awesome. And Dale Jarrett he’s a ford guy said Hey I watched some of that, it look wild in the rain – I think if nothing else it raised a fair amount of awareness and fascination about the corvette program because of Sr and Jr’s interest to drive in it. It led to opportunities in DEI and a bit of friendship with Dale Jr and was able to drive for him this year with Rick Hendrick – we’re batting a 100 right now. Tell me a bit about the handshake deal you had with Dale Earnhardt to drive for him before he died. At Daytona 2001 we talked about it. 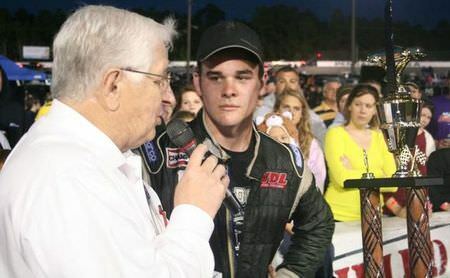 He felt that I should have been in Cup and Dale spent a lot of time talking about it – he didn’t have to convince me but he spent a fair of time talking to my wife Linda to convince her. 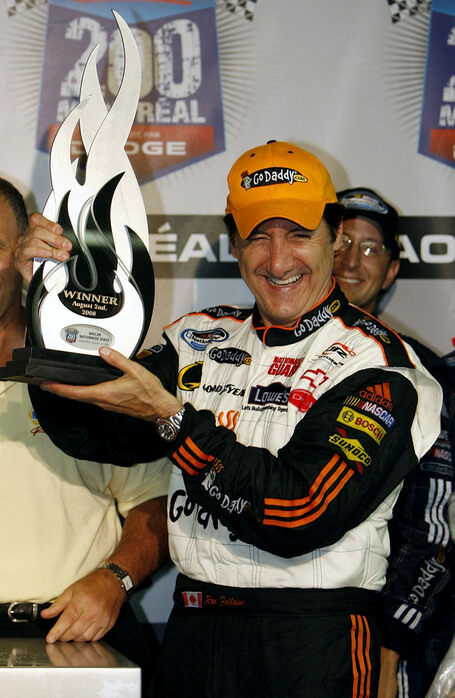 The nice thing was is that although I didn’t get an opportunity full-time the people that worked for Dale when there was an opportunity to plug me into one of their cars – although the first time was two years after his accident – they didn’t forget that it was something that Dale wanted to happen that Dale wanted me to drive one of his cars. Some of the best races I’ve had have been in DEI cars. Do you think soft wall technology should be on the straight-aways too? Yes. You never know about the freak accident. Jeff Gordon had one incident where he hit in a spot where there was exposed concrete wall (Las Vegas – editor) were it was thought a car would never reach. You just never know. The tracks have done a terrific job eliminating the grass between the long straits and the inside retaining wall and putting in rough asphalt to continue to create some level of friction when the cars are out of control. I think eventually they’ll look at adding the safer barriers even on the inside retaining walls. 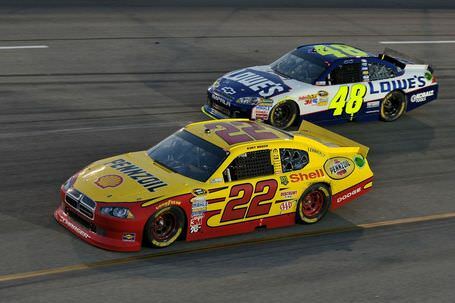 What are your plans for Sprint Cup this year (2009)? What I would like to do and what is reality are two different things. The economy has affected everyone including car racing and NASCAR isn’t immune to the financial woes of the banking and car industries. So right now I don’t have anything, but I am hoping to be able to drive for Dale Jr again for a couple of road races in Nationwide and hopefully get an opportunity in cup for the two road races in Cup. Right now there is nothing going on, just idle chat. Any indication of retiring when you called Linda over to celebrate in the winners circle at Montreal or were you just caught up in the moment? Ya, I think somewhat I was caught up in the moment and I think that the reality of it is that at 49 I’ve got more races behind me than in front me and I just wanted my wife and family to enjoy the moment because you don’t know, you just don’t know. That was a race that I very badly wanted to win just based on the years that I’ve been going there as a fan and I had a couple of big wins there in the GM Series, watch Gilles race there and to be a Canadian and to win there on a circuit named after Gilles Villeneuve doesn’t get any better than that. Do you have any retirement plans or are you just taking it as it comes? No I don’t have any retirement plans, I still want to driver but certainly it’s an unsettling time in the car business and car racing is part of the car business, so we are working very hard right now with the driving school out in Spring Mountains getting that off of the ground. Part of the motivation with that is that the all of the Corvette ZR-1s in the US come with a 2-day school and my school is one of the two schools authorized and recognized by Chevrolet as a place for ZR-1 owners to come and use their two day certificates. Canadian Race car drivers like Patrick Carpentier in Cup have had the short end of a bad stick lately, how does that impact on Canadian race car drivers do you feel? The unfortunate part with Patrick Carpentier is that he wasn’t able to stay there long enough. He can figure it out but he needs to have a stable ownership and an opportunity and it really needs to be a 3 year program but he wasn’t able to hang in there and that’s too bad. Part of it is the loss of sponsorship there as well as they didn’t have any real results, but it’s to be expected in your first year. I think that in the future with the Canadian Tire Series there is great potential for the next 5-7 years through the Canadian tire series … inaudible … a potential Sprint Cup Champion that happens to be a Canuck and learned the ropes in the Canadian Tire series. When it was CASCAR it wasn’t really on the radar of kids in terms of a career path but with NASCAR getting involved with an Iconic Canadian company like Canadian Tire it is definitely on the radar in term of going closed wheel instead of open wheel and it will be interesting to see how it shakes down in the next 5-7 years. Favourite Song or favourite band? What star living or dead would you like to meet? Amp, So-Be No Fear, or Red Bull? That is a loaded question, I’m gonna have to say Amp. Favourite track to race at? Unfortunately the Leafs, I’ve got season tickets. Best race car driver ever alive or dead?